The more I started commenting on other blogs, the more people commented on mine, I found. I discovered a little community of like-minded friends; we’d comment on each others’ blogs regularly, apologizing for not having caught up if we didn’t leave a day-of comment. I admit, sometimes I’d comment, just to leave a mark: “that looks delicious!” I’d take it personally that friends I interacted with regularly in real life didn’t take the time to comment on my blog posts. I’d drop things in conversation like, “Well, I wrote about this on my blog…” As though expecting that they should be caught up on my life based on my Internet life. For many of my friends, though, real life and Internet life are very, very far apart. A friend of mine who is a nurse practitioner doesn’t have a Facebook account, no less a Pinterest page. Few of my friends use Twitter. To them, this site might as well be a password-protected Livejournal. This thing we do here, it’s utterly personal. And feels like real life, most of the time. Like chatter at the farmer’s market, or a coffee date with friends, the conversations, with many of my fellow blogger friends, don’t seem like they’re happening ‘on the Internet.’ It’s not this wild west thing, the Internet. To us, it has become the farmer’s market, the coffee shop. It is accessible. The validation of getting comments can sometimes bleed into the desire for validation in real life, away from the computer screen. The more of us we put out, the more we tend to expect to get in return. Here and there, I ask myself: am I writing for comments? And the answer I come back to, over and over again, is no. But deep down inside, a little voice says: but they are nice to get. I’ve been thinking about validation, how much we crave it in our personal and professional lives. The pageviews and the promotions at work, the Pinteresting DIY projects, and the mommy wars. The Lean In Circles and the Kickstarters. We all want somebody — or somebodies — to tell us: Hey, you. You are doing GREAT! That’s not just a problem of the Internet age, that’s an age-old human emotion. You can, if you’d like. I’d like that. But if you don’t, and you read this post and go on about your day, that’s totally cool, too. I think I’ll still keep writing. Because at the end of the day, it makes me happy. And I’m in pretty deep here. I’m reminded that regardless of whether you get a pat on the back or not — a virtual high five — it’s the stuff that makes you feel comfort inside that you should keep on doing. 1. 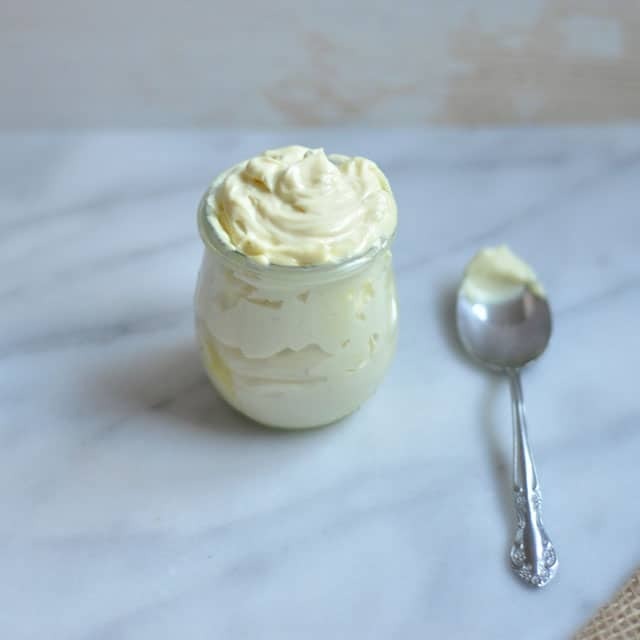 Preheat the oven to 450 degrees F. To make the aioli: Combine the mustard, one tablespoon of water, egg yolks and a few drop of lemon juice in a food processor. Start the processor and gradually add a couple of oil drops. Very, very slowly, stream in the oil until you’ve incorporated about 1 cup of it. The mixture should be pretty thick. 2. Add another tablespoon of water and a few more drops of lemon juice, season with salt and pepper and continue slowly streaming in the rest of the oil, with the processor running on high speed. Set aside as you prepare the fries. 3. Briefly place the potato sticks in ice cold water. Drain, then toss the potatoes with olive oil, salt and pepper. Oil a large baking sheet, then evenly spread the potatoes in one layer. Bake for about 30 minutes (or until golden brown and crispy on the outside). 4. 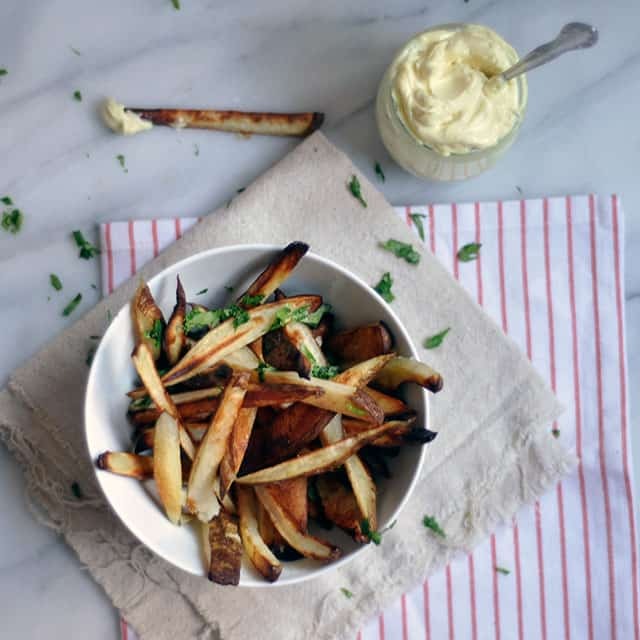 Sprinkle fries with cilantro and serve with aioli. 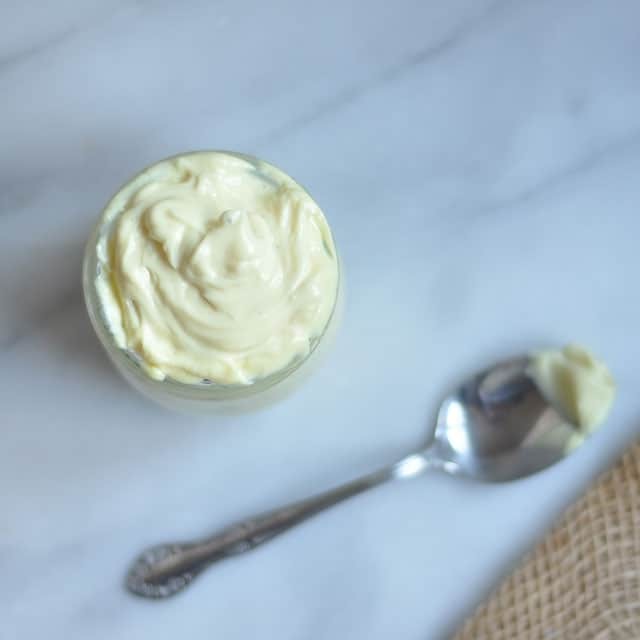 Homemade aioli will keep int the fridge in a sealed container for about 3 days. 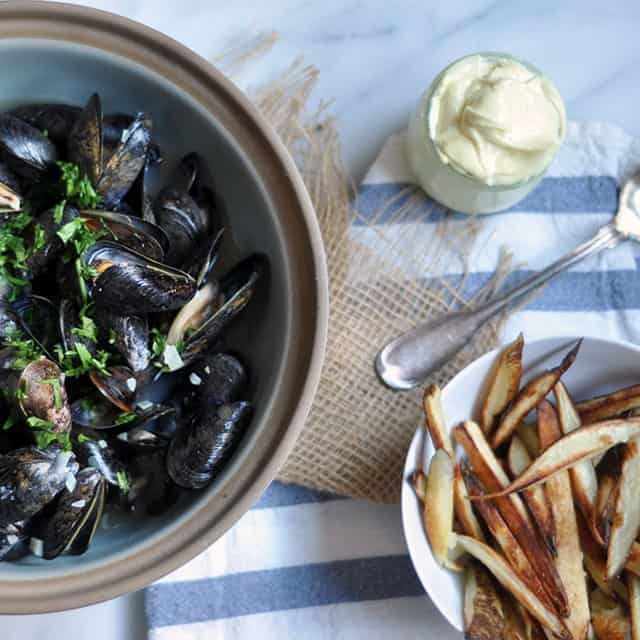 We like to eat these with beer-steamed mussels.